I’m so bad at suspense/surprises. I wanted to write this post and say LOOK AT THE COOL THING AT THE END SURPRISE but instead I put the cool thing in the title. In any case, last weekend I went to my college reunion and saw a dear friend who is doing an incredibly cool summer project about teaching and very thoughtfully teaches math to high school students during the school year. She was wearing an amazing pair of earrings, which are the topic of this post. Let’s look at them separately and then together. First, the top, with the square embedded in the larger square. We’re going to use some variables (which we talked about in this old post). Notice that the triangles on the four sides are all identical right triangles. Let’s label the sides of them: a for the short side, b for the longer leg, and c for the hypotenuse. I LOVE visual proofs. Personally I find them much more convincing than lists of equations with no pictures. Spoiler alert that’s what we’re doing right now (visual proof, not a list of equations)! Since the inner gray square is a square, and all of its sides are labeled by c, the area of the inner gray square must be . Once, during a calculus test, a student asked me for the formula for the area of a triangle. I got mildly upset and said to think about it for a few minutes/come back to the question. Eventually he got it, but I think it’s because another TA told him the formula. Anyways, the area of the blue triangle is half of the base times the height, so it’s . With four blue triangles, we have a total of 2ab area from the triangles. So the total area of the larger square is . But I can also look at the outside square. Its sides are made up of one short blue leg and one long blue leg, so the large square side length is a+b, which means the outside square area is . Then the first earring gives me the equation . Now let’s look at the second earring. I’m going to use the same variables since they’re the same triangles. Here, all four pink triangles are identical. The orange square has a for all of its sides, and the green has b sides, so we know their areas. We also still know the area of the pink triangles. If, like that calculus student, you happened to forget the formula for the area of a triangle, you can see it here: two triangles together form a rectangle with base a and height b, so the area of the rectangle is ab. As the rectangle was made up of two identical triangles, you can see the area of each individual triangle is 1/2ab. Again, the length of the side of the larger square is a+b, so the larger square’s area is . Summing up the orange square, green square, and four pink triangles gives another expression for the area of the larger square. WHAT IT’S THE PYTHAGOREAN THEOREM WHERE DID THAT COME FROM THIS IS SO COOL! 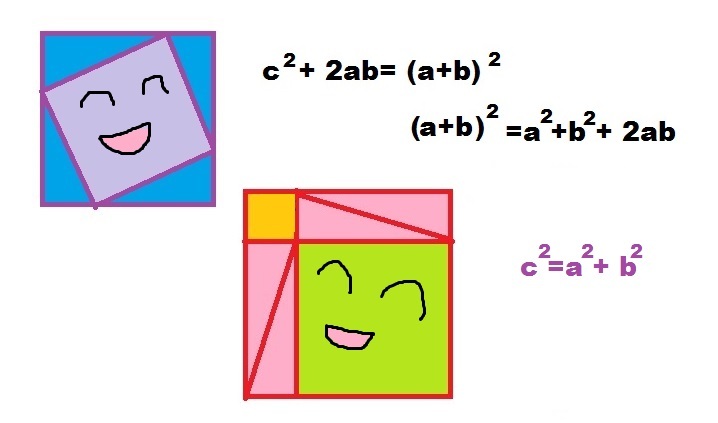 Just look at how happy the squares are. That’s how happy I felt when I saw Shira’s earrings, and also how happy I hope you feel after seeing them too. Side note, I need to bake something. Unfortunately those lime pies from a few months ago were so delicious that every time I feel like baking, I make those pies. Another dear friend who does not do math asked me to try making pretzel salad, so that’s on the agenda, but my in-laws just visited and left a box of graham crackers. Yes, we could feed them to the baby, but they’re just sugar and honey (which you shouldn’t feed to babies), so I’ll clearly make a graham cracker crust and might accidentally make another lime pie unless inspiration strikes. We’ll see! ← What is the fundamental group?